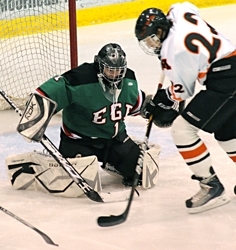 Moorhead's Michael BItzer continued his terrific play in nets with 25 saves (Photo by Tim Kolehmainen). Eric Brenk (22) of Moorhead scores the first goal of the game, his team-leading seventh of the season (Photo by Tim Kolehmainen). Moorhead coach Dave Morinville knows his team isn’t blessed with many natural goal-scorers who can walk through a defense or snipe from the top of the circles. What his Spuds have to do is force the issue. 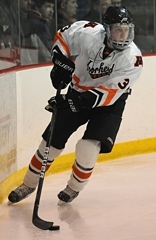 The Spuds (5-3-1) certainly did so Tuesday night at the Moorhead Sports Center, crashing the net hard in a 5-2 victory over East Grand Forks (6-5-0). 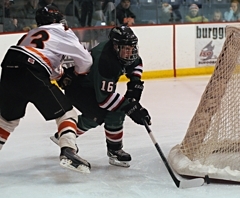 Four of Moorhead’s five goals came from in tight, including a pair for sophomore winger Tony Uglem. “He’s been banging on the door. He’s just a hard-nosed, honest hockey player,” said Morinville. For a team that struggled to score goals through the first month of the season, Moorhead has now won three of its last four games since a 6-0 running-time home loss to Duluth East on Dec. 22. That stretch has included a victory over the then-No. 1 team in the state (Wayzata) in the Hockey Holiday Classic in St. Louis Park and Tuesday night’s five-goal outburst – the Spuds’ highest-scoring game of the season. Morinville attributed the recent streak to a realization among his players that they would have to grind out games. 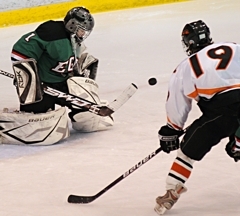 Uglem netted his first goal directly off a face off to the left of East Grand Forks goaltender Hunter Aubol. He picked up a face off win from center Ben Doda and ripped a shot over Aubol’s shoulder to give Moorhead a 3-1 lead midway through the second period. Brendan Johnson also scored off a draw from Bryant Christian in the third period to give the Spuds a 4-2 lead. 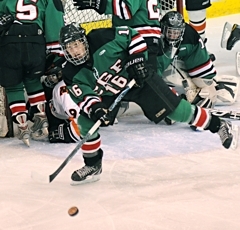 “Guys just weren’t wrapping up,” shrugged East Grand Forks junior Zack Lawdermilt. Uglem’s second goal capped the scoring with 10:07 remaining in the game, as Aubol couldn’t snare a Nic Oxton shot with his glove. Uglem swept in and wrapped the rebound around Aubol for a 5-2 lead. 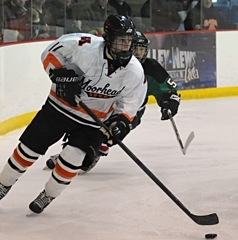 Oxton and Eric Brenk each had first-period goals for Moorhead. 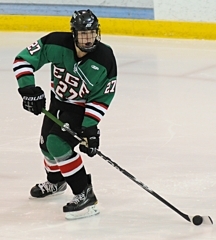 East Grand Forks picked up goals from Cory Mack in the first and Tyler Hajicek in the second. 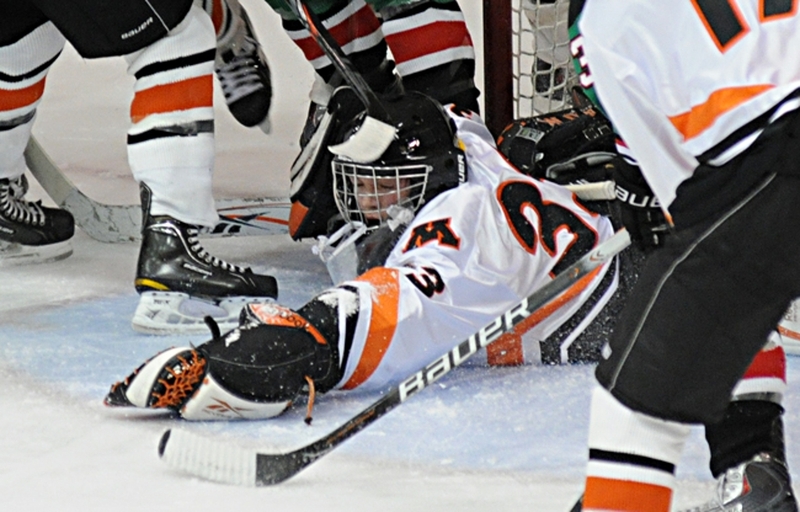 Hajicek’s goal came just six seconds into a power play that cut the Spuds’ lead to just 3-2, but Moorhead goaltender Michael Bitzer made sure the lead stood up. He made several outstanding saves in the game, including a toe save that kept the Green Wave at bay. Bitzer stopped 25 of 27 shots. Moorhead hits the road for its next four games, beginning at Thief River Falls this Thursday and concluding with a rematch at Wayzata on Jan. 15. 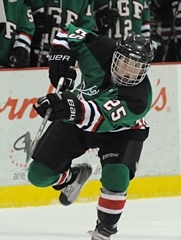 East Grand Forks returns home for a Thursday game against Grand Forks Red River (N.D.) before a Saturday date at Roseau. The junior goaltender continued his stellar play this season, making 25 saves on 27 shots. With the game still in doubt in the second period, he had a toe save on the Green Wave that wowed the crowd with its athleticism. One of three Uglem boys to play on the Spuds' squad, Tony scored his first two goals of the season, including the game-winner off a face off midway through the second period. The sophomore forward also rounded out the scoring on a rebound with 10:07 remaining. The senior defenseman had the offensive play of the night, rushing the puck on a short-handed break, deking East Grand Forks' goalie Hunter Aubol and then patiently tucking it past his outstretched blocker to give Moorhead a 2-1 lead. Oxton paid the price by crashing shoulder-first into the goal post. 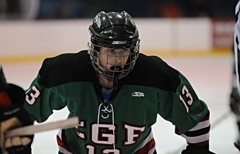 A smooth skater with great offensive promise. 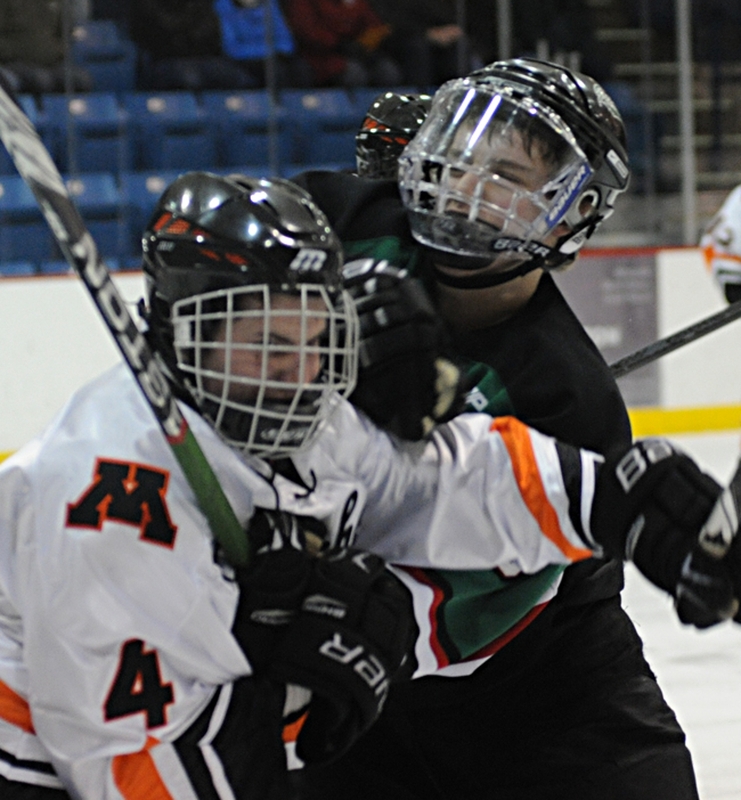 Moorhead's Nic Oxton (4) goes face-to-face with an East Grand Forks player (Photo by Tim Kolehmainen).